There's no doubt that some people have become a Linux user after seeing a video of Compiz Fusion in action on YouTube or wherever. During the first few days or weeks, sure they will enjoy the experience of having an extraordinary desktop that they can show off to their Vista-using friends. However, like some of us, there will come a time that these new-to-Linux users will get bored with those extra eye-candies and will realize that they don't really need them. Now, if more and more people will lose interest in those stunning desktop effects, then the future of Compiz-Fusion and other compositing window managers for Linux will surely be bleak. I have some suggestions that I hope could help make Linux desktop effects exciting once more. 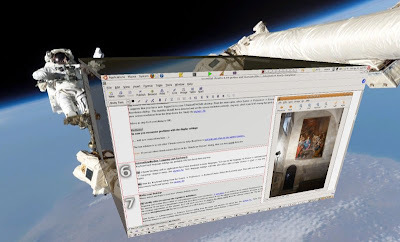 Nowadays, I still appreciate a few useful Compiz plugins like Scale (Mac OS X Exposé clone), Ezoom (Enhanced Zoom Desktop), and Annotate among others. So, I think the developers should focus on improving those handy plugins. But what about the many plugins that are more entertaining than useful? Should the developers just scrap them? --I don't think scrapping them would be a good idea. Instead, make those entertaining effects even more enjoyable. If possible, why not integrate some fun and challenging games with those plugins. People love challenges. Instead of snow, why not let bricks fall from the top of the screen so that you can instantly play brick game, or how about playing a game like Hangman while the 3D desktop keeps on rotating. I think something like those games would make Compiz effects a lot more interesting. I know adding a game AI will not be a walk in the park, but I believe it can be done. Anyway, these are all my crazy ideas. You are always free to share with us your own views via comment on how to bring back the excitement to Linux desktop effects. 2 years ago I was one of those going nuts over linux desktop effects, my focus eventually changed to machine performance. i now find myself not using any kind of desktop effects. I think it would be very exciting if we get the same desktop effects with minimal memory footprint.